This BLOG is a crystallized manifestation of my devotion to Anthroposophy, Spiritual Science & a RE-MEMBERED Golden Age WithIN. This is yet another Supernatural facet of THE GREAT WORK created to cultivate a stronger Inner Connection to Higher Faculties of Wisdom & to nourish the Clairvoyant powers of ImagINation, INtuition, INstinct & INspiration that are the Sacred Building Substances & Awakening Elixirs for Dormant Spiritual Organs withIN. For those who have the EYES to SEE it, the EARS to HEAR it & the BODIES to FEEL it, the time has come to truly awaken our Clairvoyant Capacities as we prepare our Holy Vessels to receive & emit more light = THE GREAT WORK. It has become crystal clear that this process of nurturing our INnate Bioluminescence cannot be rushed, but little by little THE WORK is done on behalf of the Evolution of Humanity. Work. Keep digging your well. Don’t think about getting off from work. Water is there somewhere. Submit to a daily practice. Your loyalty to that is a ring on the door. Keep knocking, and the joy inside will eventually open a window and look out to see who’s there. This BLOG is a grounding & RE-earthing of all that has led me & many others to RE-cognizing the SACRED in the seemingly mundane & RE-birthing our 4 fold Human Being (Physical/Etheric/Astral/Spirit) in the Divine Fluids of AWE & MAJESTY. Every aspect of the work that I do in the world is meant to R E S U R R E C T the WORD into INspired Thought that is in Visionary Service to the Heart & Womb. Through this Full Body Prayer, the intellect bows to the feeling life & Spiritual Forces are birthed that work upon the soul life to awaken the Will Forces & INfuse those who engage & partake with expansive Spiritual Strength to take up great courage & do what they came here to do…to deliver to this planet Divine Inheritance & Oracular Vision. One by one, those whom I serve are rebirthing their Inner Sight in such a way that they can perceive anew the vast Spiritual Beings who desire to permeate each and every human being with Original Innocence & Holy Remembrance in order to Immaculately Conceive New Light again & again on behalf of ALL LIVING BEINGS. To “live the legacy” is to truly experience a Divine Marriage of Dark & Light withIN so that you can conceive the world anew without. This re-gestated perception becomes a well of gratitude withIN that enables us to stay soft & open in the presence of difficult situations or challenges so that we can extract the nectar from the germinal seed within the happening & transmute any perceived malevolence into benevolence & love on behalf of far-distant futures of humanity. The NEW ISIS is the Womb of Light withIN which we have the opportunity to Break Bread with a Life-Well-Lived. SHE is the NEW EDUCATION. 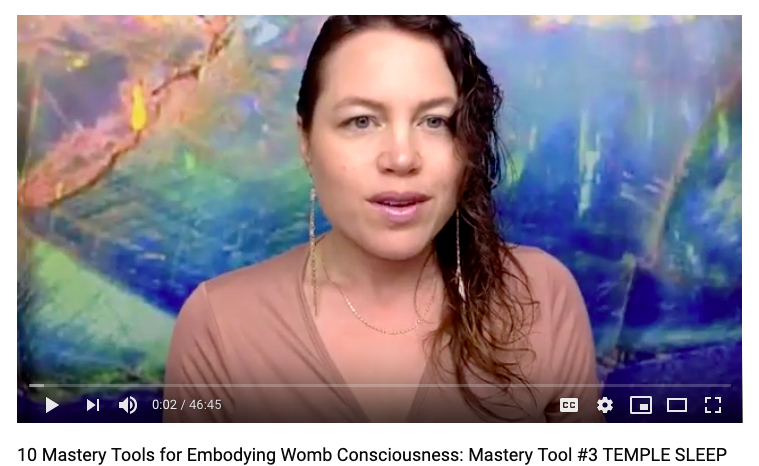 I just recently presented a New Discussion in the Supernatural LIVE video series: The 10 Mastery Tools for Embodied Womb Consciousness where I unveiled the 3rd Mastery Tool- TEMPLE SLEEP. SUBSCRIBE to R E C E I V E this GIFT! In this LIVE I mentioned that the ancient art of Temple Sleep was engineered by Egyptian Priests who maintained and cultivated pristine 4 fold organisms: Physical, Etheric, Astral & Spiritual bodies. What I didn’t mention is that they were initiated into their evolved Divine Human Essence by SHE. It was ISIS who melted their hearts & enlivened their beings with SOPHIA. It was SHE who met those with whom the priests shared this Immaculate Wisdom. TEMPLE SLEEP was the ‘medium’ for this Vast Remembrance & Miraculous Healing. We find around us a world of light phenomena, can observe in the natural world around us everything that appears by virtue of what we call light, and that this in turn embodies dying thoughts of the cosmos or, in other words, universal thoughts which, in the far-flung past, existed as the thought worlds of particular beings- thought worlds within which, at that primordial time, world beings perceived their universal secrets. The thoughts of that distant era still shine brightly for us, but in a sense as the corpses of thought, of dying world thought. This is the light that shines for us. Looking back to far-distant eras, therefore, we can say that these entities wandered through the world as it was then in the same way we now make our way through life as thinking beings. What lived in them, however, became external universal thought. And what lived in them as thinking in those times, visible externally only as their light aura, is now seen by us in our surroundings, appearing in light phenomena. And therefore we must regard these phenomena as dying thought worlds. Darkness plays into these light phenomena too; and in darkness comes expression all that, by contrast to light, can be regarded as will in soul-spiritual terms or, with more of a nod to the Orient, can be called love. In looking out into the world we see the world of luminosity on the one hand, if I may call it that. But in fact we would not see this luminous world at all- which is always transparent to the senses- if darkness did not at the same time render itself perceptible in it. And we must plumb the darkness pervading the world to discover what lives in us as will, at the first level of the psyche. Just as the external world can be seen as a harmony of darkness and light, so our own inner life can be regarded in terms of light and darkness. In our own awareness light is thought or idea while darkness is the will in us, and becomes benevolence, love and so forth. As you can see, this gives us a world-view in which soul nature is not just an inward quality, and what lives outwardly in nature is not just natural. Instead, what lives around us in nature is the outcome of former moral occurrences, in the form of dying thought worlds manifesting as light. However, if we pursue this further we find that, while the power at work in the thoughts that live within us originates in our past experience, we also continually infuse our thoughts with will originating in the rest of our organism. In their most intrinsic nature our thoughts are the residue of an ancient past, but permeated by will. Pure thinking...is pervaded by the will. So at present we stand here and gaze out into nature. If we choose, we can stand here in a mode of enquiry that is dry, sober and abstract. We can analyse light and its phenomena as physicists do this, in an inwardly detached manner as laboratory researchers. From this some very fine and fascinating things can emerge, but we will not be meeting the outer world with our full humanity. We will only do so when we feel a full sense of what we meet in the red of dawn, in the blue firmament of the heavens, in the green plant or the lapping wave. When I speak of light I am referring not just to the light perceptible to the eyes but to everything we perceive through our senses. What do we perceive by these means? It is a world that can lift the soul, and reveals itself to the soul in the way necessary to us if we are to gain a sense of meaning in a meaningful world. We do not invoke our full humanity by standing detached from the world and drily analysing as physicists do. A world-view charged with reality has this important outcome, leading us to look upon the world not only in dry analysis but with all possible gratitude for beings whose thinking and deeds, at the dawn of time, have created the surrounding world with it power to uplift us. Let us picture this with fitting intensity, filling ourselves with a sense of gratitude to a previous humankind for creating what surrounds us. Let us fill ourselves with this thought. And then also humble ourselves enough to embrace this moral ideal: that our own thoughts and feelings likewise must enable beings who come after us to look upon a surrounding world for which they can be as grateful as we can be to our far-distant ancestors of the past, who now literally surround us in luminous spiritual activity. We see today a luminous world around us. Millions of years ago this was a moral world. We bear within us a moral world; in millions of year this too will become a world of shining radiance. We develop such feeling through a world-view that invokes our whole being, whereas one that excludes aspects of us may lead to all kinds of ideas and concepts, all sorts of theories about the world, but does not fulfill us because it leaves our life of feeling empty. There is in fact a very practical aspect to invoking our whole being, although nowadays people scarcely discern it. Anyone who is honestly concerned about the contemporary world knows that he cannot just let it slide into decline. He wants instead to cultivate a future form of education for both children and adults which does not mean, say, going to college at 9 in the morning with some kind of weary, indifferent feeling, and coming out again at the end of the day with nothing more than a bit of pride at having ‘improved’ one’s mind a little- if, indeed, one has. Instead, we can look to a future when students emerge at the end of their college day and take with them feelings that engage with universal themes because, alongside mere cleverness, a sense of the evolving world has been implanted in them: a sense of gratitude towards a long-gone past when beings actively shaped the nature that now surrounds us in the form that it does, and a sense of great responsibility because our moral impulses will eventually become worlds of light. The spaces that I hold are devoted to this NEW EDUCATION & the necessary processes of Spiritual Evolution & ETERNAL Immaculate Conception through a revolutionary form of TEMPLE SLEEP called Deep Seeing™. The Cosmic Earth Mystery School that I have the honor of sharing with the world is a FULL IMMERSION into the Great Womb through the Mesmerizing Healing Art of Deep Seeing™ that will birth forth your Inner Majesty & END your search for the Holy Grail, because you will discover what lies withIN you & you will be forever changed by this New Knowing. Instead you will walk out the legends withIN the Holy Grail & wash the feet of the Great Mystery all the days of your life. You will traverse the earth as a DEVOUT Human Being, baptized by SHE into Universal Spirituality, living the legacy that is your Divine INheritance. You will learn the Art of Dying to Live & as a consequence, you will liberate yourself & your people. You will come to know the Beloved withIN & you will finally BELONG. You will BECOME THE LONGING & Prosper. Be BOLD & BRAZEN. Reclaim your Innocence & ARRIVE at your Central Sun. Go forth & Prosper. Click below to begin the Sacred Application Process. *my textured art is an attempt to visually relay to you the DEEP FEELING STATES & Supersensible Sight that I experience on my journey through life (otherwise known as SYNETHESIA or the blending of the senses). In the Spirit lay the seed of my body. The light of the things around me. In my body lives the seed of the Spirit. The light of the Spirit-Beings. The conscious instrument of Their Deeds. The Bosnian Pyramid Complex holds the Gaian Codes for the Rebirth of the Circulatory System of Humanity. As it relates to the human body, the head represents the Feminine Spirit, the less dense matter, the past as Archetypical Expression, the Cosmic Memory…the keeper of wisdom as a BEING. S O P H I A. Thought as Picture which produces Transformative Feeling. The head provides the connection to the higher realms of knowledge & GIFTS of the Feminine Essence: INtuition, imagINation, INstinct & INspiration. The limbs represent the Masculine Essence, the more dense matter, the forces of WILL, the vigor through which a person realizes the Spiritual Dream INto Earthly Form…the conduit through which the Cosmic Memory becomes an Earthly Paradigm. Through the limbs, the Promise penetrates Matter through the life forces & transmutation takes place that nurtures the maturity of the oversoul of Humanity. INspired Action becomes Energy transformed INto Matter. Enthusiasm, Burning Desire, Devotion, & Perseverance (among others) produce Mastery of certain skills that then emit stronger fragrances of Beauty & Strength that live on beyond death & INto the next life as Evolved Clairvoyance, supporting ALL to SEE with New Eyes…a process that takes place over great spans of time. It’s almost as if we each have the biological potential to become a mini pyramid with the power to provide equilibrium of the soul & elemental balance, not only for ourselves, but for all those who feel & witness our presence. But HOW do the Masculine & Feminine essence harmoniously communicate & break bread with one another? What is the missing link that so many are striving to Re-Member? The Heart & the Circulatory System. The medium between the poles of light. The upright nature of the Human Being. The Majesty. The Golden Path to God. The Original Blueprint. Direct communion with Source via Gnosis…Sacred Union with The Beloved…is made healthfully & sustainably possible through a clarified HEART that is awakened to it’s multidimensional nature via a purified circulatory system. What bogs down the circulatory system & festers the Core Wound of SEPARATION? The capacity to bring forth the goodness of the soul through the portals of the unseen is weakened, and overtime the result is a humanity deeply attached to doctrine & dogma…because the channel for gnosis has atrophied, but the desire to maintain a connection with spirit is so strong that the people will cling to words on a page & a person who has deemed themselves worthy of direct connection to God who tells them what is right & wrong. The heart disconnected from the Cosmic Forces of the head & the Life Forces of the Limbs becomes a mere pump…a means to an end. Divine Union of this TRINITY…Head, Heart & Hands…becomes a Synthesized Process of Eternal Communion with all that is Holy…The Kingdom of Heaven majestically made manifest here on Earth through a clean & clear channel. The Supernatural UPRIGHT Human Being is Birthed: The Divine Human Being that can hold both Joy & Sorrow with the same Equanimity of Soul, marrying 2 seeming opposites, again & again to Immaculately Conceive a Divine Third: GRATITUDE. GRATITUDE is the Sacred Fluid of the Inner Sanctum…the Amrita from which ALL Life Flows Prosperously Forth. Now, the planetary forces are changing & some are hearing & heeding the call to return to The Beloved through this Direct Mediumship mentioned above. But these INitiates must walk through the flames of purification again & again, maintaining a humble & resourceful countenance. Those who are READY are being called to certain places on the earth to RECLINE INto the Sacred Geometrical REMEMBRANCE provided by the unique qualities & ley lines of the land. Ley lines /leɪ laɪnz/ are apparent alignments of landmarks, religious sites, and man-made structures. The pseudoscientific belief that these apparent lines are not accidental speculates that they are straight navigable paths and have spiritual significance. WithIN the belly of Bosnia lies a key activation for the REUNIFICATION of head and limbs. A HEART restoration like no other. An antidote to the anti-life energy of War-Imprint Programming & all that comes with it. The REveal of Shamballa, the Holy Land, withIN & without. Through communion with this Holographic Eden, the wasteland is restored. "The time will come when human beings will again look into the spiritual world and will see the land there from which those streams flow down that give true spiritual nourishment to everything that happens in the physical world. We have, indeed, always seen that it was possible for human beings with the old clairvoyance to look into the spiritual world. The Oriental writings contain in their traditions something like a record handed down about an ancient spiritual land that human beings were once able to behold, from which they could draw all that could flow into the physical world from the super-sensible. Many descriptions of that land, which human beings were once able to reach and which seems to have withdrawn, are full of melancholy. This land was, indeed, once accessible to human beings, and it will now be accessible to them again, since Kali Yuga, the Dark Age, has run its course. Initiation, however, always led into that mysterious land, which is spoken of as a country that seemed to have vanished out of the sphere of human experience. It withdrew during Kali Yuga, but for those who had received initiation there was always the possibility of guiding their steps into it. The accounts of this ancient country are touching. It is the same land to which the initiates again and again repair in order to fetch from it the new streams and impulses for all that is to be given to humanity from century to century. Again and again those who stand in this relationship with the spiritual world enter this mysterious land, which is called Shamballa. It is the primal fountainhead, into which clairvoyant sight once reached but which withdrew during Kali Yuga. It is spoken of as one would speak of an ancient fairyland, one that will return, however, into the realm of human beings. There will be Shamballa again after Kali Yuga has run its course. Humanity, through normal human faculties, will again grow into the land of Shamballa, from which the initiates bring strength and wisdom for their mission. There is Shamballa; there was Shamballa; Shamballa will come to be again for humanity." What we do for ourselves, we also do for Humanity. Are you hearing the call to KNOW more about HOW the Bosnian Pyramids may serve the evolution of your soul? I’m offering a unique & Luscious EXPERIENCE in October of this year 2019 for an INtimate group of Soul Led Visionary INdividuals who desire to MUSEmind with me as your guide at the Bosnian Pyramid Complex in Bosnia and Herzegovina. One of the ways in which you can begin to OPEN to the Next Best Steps on your journey is to awaken to the watery realms of REMEMBRANCE withIN. This reconnection to your Inner Life, established in a NEW WAY, will nourish your INtuition, INstinct, & imagINation (the realms of Higher Knowledge) & INspire a more Prosperous Relationship to all of Life. This is a Divine INvitation for both Men & Women to partake in the GARDEN OF ORIGINAL INNOCENCE Transmission/Guided Meditation, that serves to imbue the soul with Deep Meaning, Vast Remembrance & Fertile Feeling. From this rebirth of the FEELING Life, a new Inner dialogue begins, supported by the Supersensible INtelligence of your Clairvoyant Self. S H A M B A L L A withIN. Once one can perceive this Land WithIN, then and only then can IT be perceived without. Access the GARDEN OF ORIGINAL INNOCENCE TRANSMISSION Now! When I was a child, I would spend timeless days on my own deep in the woods behind our home. There was a stream that meandered through the back side of the land on which we lived that was a favorite daydreaming spot of mine. It was not uncommon for me to lay down at the edge of the stream bed and dip my hands in the pools of water where the trickling creek would pause to find its way again before passing on by. In the heat of the summer, I would scout out the spots that contained fresh frog eggs and languish in the sound of mother and father frogs singing to one another with wild and radical abandon. The sound was vibrationally intoxicating and there was something otherworldly in the way each individual voice merged with the whole to produce an infinite symphony of primal wisdom that oozed with the promise of eternal Life. In my mystical innocence, there was no fear for me in reaching below the dim water to feel around for that fertile squishy delight. Once in my hands, the combination of slippery cool and juicy goodness was heavenly. Holding the frog eggs in my hands ever so delicately felt like holding God. Peering into the creation process unfolding right in the palm of my hand was an Activation like no other, almost as if the infinite Universe opened up around my hands and I could see beyond the Seen as the flower of life expanded from one divinely connected frog egg to another. A gigantic "YES" to life arose throughout my entire being. Some call it levitation. I call it holographic suspension - you can taste the feeling of the sound you see. You touch the Great Mystery and you are forever changed. This Holographic Suspension or SYNESTHESIA is a vital aspect of Clairvoyance that, when preserved & cultivated as a child, becomes a powerful, visceral & prosperous bridge between the worlds. We all have the capacity to maintain this multidimensional “way of being” that was first experienced as we came into form withIN the womb & then later nurtured through childhood fantasy (which is very REAL). In the womb, a developing human can taste the mother’s emotions, hear her visions & feel her thoughts (amongst many other combinations). The senses intermingle in such a way that the Biological Brilliance of gestation unfolds withIN a Womb Conscious Environment where everything makes scents, vibration & texture. The placenta is the Spiritual Organ through which all other Spiritual Organs of the developing child are nurtured & awakened, or not. The Womb Environment is of the utmost importance because the quality of the gestational experience sets the child up to THRIVE as a 4 fold Human Being (physical, etheric, astral & spirit) or to merely SURVIVE solely as a physical body with dormant connections to the remaining TRINITY (astral, etheric & spirit). Later, as a budding child & for the first 7 years of life, children are held in an external womb…the womb of Gaia…where they continue to incarnate into their physical bodies by being enwombed within their own Spiritual Senses which are supported by the elemental beings, nature, love, empathy, compassion & tenderness. Children organically vibrate at a much slower rate, very much like plants, because they are deeply connected to the Astral realms in the early years (& perhaps for much longer). This Astral & Spiritual connection strengthens the quality of the Etheric Body (the blood, nervous system & cellular structure) as the physical body continues to form (the physical body is not fully formed until the age of 28). Unfortunately, many are not given the opportunity to FULLY experience the Mystery School & Initiation that is a properly held childhood. Far too many adults suffer from what is known as ABANDONMENT wounds, which in the beginning stages of SELF-Development may feel very “blood” related (i.e. directly related to our blood relations), but as one digs deeper, this is a much bigger piece that streams directly into the core wound of SEPARATION from Source. Often, one may “think” that they were abandoned by a physical parent, and perhaps they were, because this is a powerful aspect of karma that thankfully sets one up to FEEL very potently the insertion point of SEPARATION from Source in order to remedy the situation in THIS LIFETIME. By the very nature of this contemplation one comes to know that they are stuck in a karmic loop, enslaved to a 1 dimensional/ 1 fold perspective on life, THE PHYSICAL plane. This is not to say that the PHYSICAL plane is not important. It very much is. Our physical body is the avatar & holy vessel through which all else can flow. THE GREAT WORK is to Liberate the Soul such that Divine Union of the 4 Fold Human Being can actually take place…a Sacred Marriage between body, blood, soul & spirit. We come to this planet to experience eternity, because only in these physical bodies can we properly experience birth & death, which releases the TRINITY from & to Source…again & again…such that the Evolution of Humanity is made possible through this dance of immortality. In the work that I do with those I serve, one of the first pieces that comes to the surface to resolve is Vast FORGIVENESS related to NOT experiencing a properly held childhood…to NOT receiving the space to nurture this connection to Source, but instead feeling “cut off” from the astral/etheric/spirit TRINITY too soon…cut off from the BELOVED. There is much grief to be held here. Grief that asks to be taken very seriously in order to transmute it back to love through the “I” of the human being where it is transformed INto WISDOM. WISDOM that births new perceptions & a more prosperous connection to INtuition, INstinct, INspiration & imagINation. It is a very beautiful thing to GRIEVE properly. To allow the body to FEEL the sorrow of SEPARATION from Source, from the BELOVED. In the case of FORGIVENESS regarding an unmet childhood, one comes to FEEL & KNOW that their physical parents were perfect portals back to Source…GRATITUDE flows & SYNESTHESIA begins to restore itself withIN…because a felt melody, woven by the parental imprints & sung by the BELOVED, begins to pulse through the etheric realms, through the blood, rebirthing the connection of Inner Sight. This Inner Sight becomes a WOMB through which all aspects of the TOMB return to LOVE. A true RECLAMATION of the Nervous System. It is a process. And one that asks for support. We are not meant to walk this path of LOVE alone. Such a definite conception can be acquired by means of certain inner exercises that are by no means easy; indeed they are difficult, but they can nevertheless be carried out. What kind of person have I been? Have I been a person with a strong inclination for reflection, for inner contemplation; or am I one who has always had more love for the sensations of the outer world, liking or disliking this or that in everyday life? Was I a child who at school like reading but not arithmetic, one who liked to hit other children but did not like being hit? Or was I a child always bound to be bullied and not smart enough to bully others? It is well to look back on one’s life in this way, and especially to ask oneself: Was I cut out of activities of the mind or of the will? What did I find easy or difficult? What happened to me that I would like to have avoided? What happenings make me say to myself: ‘I am glad this has come to pass’- and so on. It is good to look back on one’s life in a certain way, and above all to envisage clearly those things that one did not like. All this leads to a more intimate knowledge of the inner kernel of our being. For example, a son who would have liked to become a poet was destined by his father to be a craftsman, and a craftsman he became, although he would sooner have been a poet. We must therefore be quite clear as to what such a retrospect into the past means; it tells us what we did not want, what we would have liked to avoid. When we have made that clear to ourselves, we really have a picture of those things in our life which have pleased us least. That is the essential point. And we must now try to live into a very remarkable conception: we must desire and will everything that we have not desired or willed. WE must imagINe to ourselves: What should I actually have become if I had ardently desired everything that in fact I did not wish for and which really went against the grain in life? In a certain sense we must here rule out what we have succeeded in overcoming, for the most important thing is that we should ardently wish or picture ourselves wishing for the things we have not desired, or concerning which we have not been able to carry out our wishes, so that we create for ourselves, in FEELING and THOUGHT, a being hitherto unfamiliar to us. We must picture ourselves as this being with great INtensity. If we can do this, if we can identify ourselves with the being we have ourselves built up in this way, we have make some real progress toward becoming acquainted with the inner soul-kernel of our being; for in the picture we have thus been able to make of our own personality there will arise something that we have not been in this present incarnation but which we have introduced INto it. Our deeper being will emerge from the picture built up in this way. You will see, therefore, that from those who wish to gain knowledge of this inner kernel of being, something is required for which people in our age have no INclination at all. If you call up the counterpart of yourself, the following thought will dawn upon you. This counterpart- difficult as it may be to realize it as a picture of yourself in this life- is nevertheless connected with you, and you cannot disown it. Once it appears, it will follow you, hover before your soul and crystalize in such a way that you will realize that it has something to do with you, but certainly not with your present life. This New Perception forms an Inner Environment ripe for Stretching out FULLY INto the 4 fold Human Being where one taps INto the Magical Inner Child & begins the process of birthing the Miraculous & Mystical Adult. All of this WORK is done through the Vast Intelligence of a New Archetype available to each of us now: THE GREAT BIRTHER. The GREAT BIRTHER holds the codes to Embodied Womb Consciousness & uses restored SYNESTHESIA as a practical tool for rebirthing the 4 fold Human Being. My Sacred Work is devoted to the Awakening of THE GREAT BIRTHER withIN & the unfoldment of the 4 Fold Human Being. Simply put, I help you FULLY Incarnate & do what you came here to do. One of the ways that you can begin this process of Re-INvisioning the Divine & Majestic Being withIN that Rudolf Steiner speaks of is through the HOLOGRAPHIC REMEMBRANCE PORTRAITS that I have the honor of creating. The process described above is brought to life through Holographic Digital Imagery that serves to OPEN & SOFTEN your being INto Vast REMEMBRANCE of Who you are & why you have come to the planet at this time. The imagery that manifests through this TRANSFORMATIONAL PROCESS kindles the Inner Sense of WARMTH, encourages the WILL to do what it does best, imbues the SOUL LIFE with deep meaning & illuminates the Golden Path of GOD withIN. Only he has an inner right to speak of evolution in the domain of outer nature who acknowledges this evolution also in the sphere of soul and spirit. Now, it is clear that this acknowledgment, this extension of knowledge of nature beyond nature is more than mere cognition. For it transforms cognition into life; it does not merely enrich man’s knowledge, it provides him with the strength for his life’s journey. It shows him whence he comes and whither he goes. And it will show him this whence and whither beyond birth and death if he steadfastly follows the direction which this knowledge indicates. He knows that everything he does is a link in the stream which flows from eternity to eternity. The point of view from which he regulates his life becomes higher and higher. The man who has not attained to this state of mind appears as though enveloped in a dense fog, for he has no idea of his true being, of his origin and goal. He follows the impulses of his nature, without any insight into these impulses. He must confess that he might follow quite different impulses, were he to illuminate his path with the light of knowledge. Under the influence of such an attitude of soul, the sense of responsibility in regard to life grows constantly. If the human being does not develop this sense of responsibility in himself, he denies, in a higher sense, his humanness. Knowledge lacking the aim to ennoble the human being is merely the satisfying of a higher curiosity. To raise knowledge to the comprehension of the spiritual, in order that it may become the strength of the whole life, is, in a higher sense, duty. It is my pleasure to hold space for the unfoldment of this process for those I serve. To RESTORE the SACRED WATERS of SYNESTHESIA. One who brings the JOY of being opened. ACCEPT THIS DIVINE INVITATION NOW! Grief & Gratitude: "Podcast Epiphany"
with my Divine Guest Anabel Vizcarra, I had an E P I P H A N Y & I was brought to the Body Memory & Slow Release Medicine of this image. Here I was sitting by the Adriatic Sea on the Dalmatian Coast of my 2nd home in Primosten CROATIA this past summer. The Sun, Sea & Rock were viscerally & visibly speaking to my Being. My whole body was vibrating with Solar Love & Sensual Sanctuary, and yet there was a bitter-sweet fragrance in the air. Through this "Podcast Epiphany" NEW KNOWING came into my existence that was seeded in the Feeling-Memory of this captured moment. In Primosten, the rocks are crystal laden (on any beach, the sand or stone incorporates crystals or minerals of some sort). The elemental communion of the water splashing against & caressing the "listening" rocks is FREEDOM at it's finest because this Sacred Union of the elements free's up "neutral" ions that then partner with other ions to create a Negative Charge, which produces more Negative Ions that "stimulate our senses...& promote alpha brain waves...which results in a higher awareness level." So while sitting by the sea or ocean, we are experiencing the Vast Intelligence of the Divine Union of fluid movement & firm penetrating mineralized memory. Sea & Stone. Grief & Gratitude. The Conscious Grief shapes & softens the Concept-Memory and the aroma of GRATITUDE fills the belly with FEELING-MEMORY that changes the trajectory of the Inner Life & imbues the SOUL with Deep Meaning. Shortly after experiencing this "podcast epiphany," spirit guided me to visit a local thrift store. Literally I heard, "go there NOW!" I had not thought of this place in eons. So I arranged to get myself to this place ASAP. I entered the store & there right by the entrance was an OLD BOOK with a copyright of 1903. It was entitled "The Better Way" by Charles Wagner & was translated from French into English. I bought the book immediately & left the store, as I knew instantly that this was the reason spirit had guided me to this place. PASSIVE GRIEF: There is a passive suffering that aggravates grief and contaminates it, just as a neglected wound becomes mortified. Be on your guard against it. Accept active suffering, which is suffering transformed into a moral impetus. Whatever is without curb or law becomes inevitably an agent of destruction. Let us face our griefs and put them in their place. Work is an excellent counterpoise for grief, but it does not of itself suffice. If you neglect, or suppress, or smother your heart by plunging into ceaseless activity you fail in your duty toward yourself. A grief has a right to our attention: we should give it its due, heed its lessons; but we should find an element to counterbalance it, to help maintain our equilibrium. What strength do I not get from the remembrance of my mother's courage under her many trials! What would have become of her if she had taken to her bed with her sorrows? She would have died of melancholy. Grief without work engenders legions of harmful thoughts. It delivers us up to fears and dark presentiments that are worse than any misfortune. If need be, go work the roads, but do not stagnate in your sorrow. If the dead could speak to us they would give this counsel. Ask hope to come to you, and human tenderness, with faith. Invite God to visit you, and all the friendly powers. Then those whom you weep will be with you. Fill your soul with the spectacle and take the memory of it away with you. Then when you breathe the stifling air of the great cities, of the crowded theatres, of sick-rooms, or the poisonous miasma in which diplomats sit in council, churchmen shape their plots, money-makers count their stakes, pendants prate, and fools parade, shut your eyes and return here in spirit. Three-fourths of our work is done within us...every worker in the world ought three-fore to habituate himself to sojourns in the desert, to which he should return ever and again to seek inspiration, to renew his armor, to listen to the voice of silence, and to let the waves aroused by the storm of strife roll unfelt across the quiet deeps of the world within. This book is NOW teaching me something new. One, something as simple as following spirit and discovering a book = a Next Best Step on this Path of LOVE, revealing yet more depths regarding healthy expressions of pain, suffering & GRIEF that lead to life-giving GRATITUDE, another important element of Sacred Prosperity. Two, SYNCHRONICITY & EPIPHANY are mighty miraculous Sign Posts that the Divine is Alive & Well withIN. Lastly, the Sacred Union of Grief + Gratitude = an Inner Environment ripe with INspiration, imagINation, INtuition & INstinct…the portals to the Realms of Higher Knowledge that lead us to the Promised Land withIN & without. Vast Gratitude Anabel Vizcarra for this INcredible “time out of time” where you delivered such profound wisdom to #thegreatworkpodcast. I am in AWE of you. The Fertile Goodness that WE created INspired me to follow my INstinct & INtuition to finally birth my BLOG, which up until this point was gestating withIN my imagINation. And of course this birth required that I allow the labor pains of grief to open & soften my heart. Deep Bow to you my Divine Sister.